The SORUS system, designed to enable user receivers to calculate Galileo PRS positions at predefined points in time including robustness against jamming and spoofing, picked up top honors at the 2017 European Satellite Navigation Competition (ESNC). SORUS, a novel satellite navigation-based solution, enables Galileo Public Regulated Service (PRS) navigation for a wide range of users while significantly reducing security requirements and Galileo PRS costs per user device. U.S. Navy photo by Mass Communication Specialist 2nd Class Nancy C. diBenedetto/Reldeased to Wikimedia Commons. Besides taking the overall win of the 2017 ESNC, SORUS also won the Special Prize of the German Federal Ministry of Transport and Digital Infrastructure (BMVI) and the Bavaria Challenge. Police, Special Forces, and other authorized Galileo PRS users can exploit this application to equip their UAVs with a secure, trustable, and spoofing-resistant positioning solution. The system enables user receivers to calculate Galileo PRS positions at predefined points in time including robustness against jamming and spoofing. SORUS circumvents all drawbacks of conventional PRS receivers and server-based techniques: No need for a PRS security module on the user receiver, no size, weight, or power problems, and many more. The application stores short sequences of Galileo PRS pseudo-random noise (PRN) code chips on user receivers prior to missions, which are only valid for the limited duration and area of a given mission. SORUS was developed by Alexander Rügamer, Fraunhofer IIS, and Dr. Jan Wendel, Airbus Defence and Space. 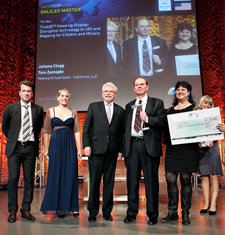 Twenty-five more business cases and Challenge winners were also recognized during the Awards Ceremony by high-ranking industry and institutional representatives, such as the European GNSS Agency (GSA), the European Space Agency (ESA), the German Aerospace Center (DLR), the German Federal Ministry of Transport and Digital Infrastructure (BMVI) and the European Committee of the Regions (CoR). In addition, 20 partner regions across the globe awarded the best competition entries. The ESNC is continuously in search of the most outstanding business ideas related to GNSS, in line with the EU Space Strategy and the EU60 goals. By fostering entrepreneurs and startups, the innovation competition has the long-term objective of strengthening Europe’s competitiveness with high-tech space solutions on the global scale. Additionally, AZO established Europe’s first E-GNSS Accelerator program, funded by the European Commission (EC). This program offers the top three pitching startups access to dedicated incubation programs at their preferred incubation center of the ESNC network all across Europe, with a worth of EUR 180,000, or about $211,329 US dollars. The ESNC Awards Ceremony took place in front of an international audience during the European Space Week 2017 in Tallinn, Estonia – in line with the Satellite Masters Conference & Horizon 2020 Space Info Day. Last year Inside GNSS reported on the 2016 ESNC, which featured a growing presence on Unmanned aerial systems (UAS).